3D tutorials, tips and techniques, inspiration and community. Here is a render showing the progress I've been making on this piece. I've added some more details—like the trash cans, the billboards, and the rail bases. I decided to add the area lights by hand, that is, duplicating them one at a time. I also linked their data (Control-L) so that whatever change is effected on one of them will be shared by them all. 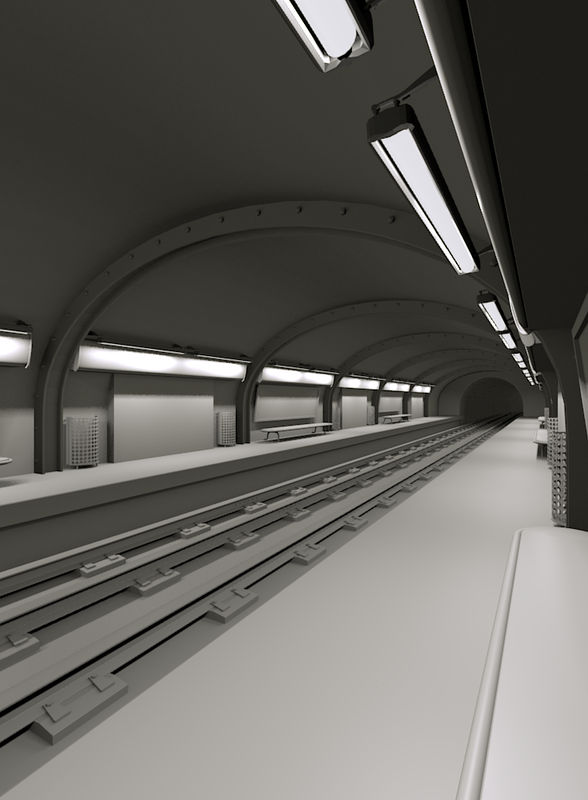 I'm going to add some detail to the tunnel, some cables, a bit more of modeling inside the station, and I'll be ready to texture. Learn Blender with a series of step-to-step tutorials dealing with modeling, camera and light setup, rendering with Cycles, material creation, compositing. Covering the latest version of Blender 2.73. Making tutorials and teaching others takes time and effort. If I can get some donations in exchange for this, it'll make it much easier for me to keep working on more educational content. I'd love to hear if you have any suggestions about any topic in particular. Suggested donation is just $1! Thanks! © 2012 Andreu Cabré. Powered by Blogger.